Lok Sabha Elections 2019: LK Advani won the 2014 election from his constituency Gandhinagar in Gujarat and Murli Manohar Joshi, who vacated his Varanasi constituency for Prime Minister Narendra Modi, won from Kanpur. Lok Sabha elections: BJP leaders say there is no ban on 75-plus politicians contesting elections. Veterans LK Advani and Murli Manohar Joshi have been asked by the ruling BJP to decide whether they want to contest the national election, due by May. "The decision is upto them," say sources, asserting that nobody above 75 will get a post. The former union ministers, elbowed aside in a mentorship role in the ruling BJP, have only their parliament membership by way of active politics. LK Advani won the 2014 election from his constituency Gandhinagar in Gujarat and Murli Manohar Joshi, who vacated his Varanasi constituency for Prime Minister Narendra Modi, won from Kanpur. BJP leaders say there is no ban on 75-plus politicians contesting elections; the age bar is only for ministers. Two other veterans who have already opted out of the election are Sushma Swaraj and Uma Bharti. Both cited their health. The BJP, however, said it is yet to decide on them. 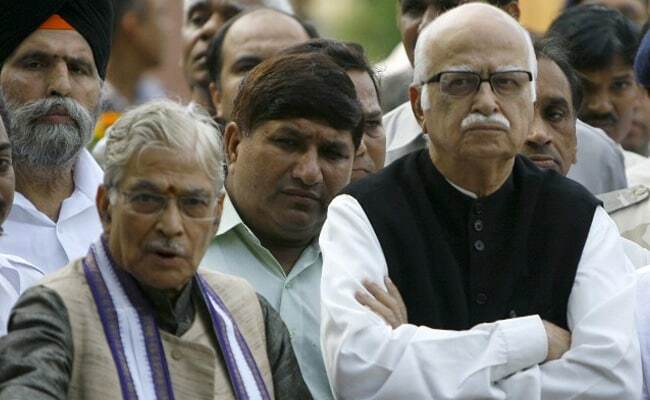 It is not known yet whether Mr Advani, 91, and Mr Joshi, 84, want to contest the polls again. Sources close to Mr Joshi say he will do whatever the party wants. In 2014, Mr Advani, Mr Joshi, Shanta Kumar and BC Khanduri won the election but were left out of Prime Minister Narendra Modi's government. Along with former prime minister Atal Bihari Vajpayee, Mr Advani and Mr Joshi were made members of a new "margdarshak mandal" which had nothing more than an advisory role. The committee has never met in the past four years. Mr Advani was said to be keen on the post of Lok Sabha Speaker but was passed over for Sumitra Mahajan. Those who did make it as ministers, found themselves "retired" because of the age bar in the next reshuffle. Mr Joshi, as the chairman of the parliamentary Estimates Committee, has over the past few months raised questions on the government's policies, discomfiting his party. The resentment of the elders on being sidelined has often come out in bouts of rebellion. After the BJP's Bihar election defeat, Mr Advani, Mr Joshi and Yashwant Sinha (who quit the BJP last year) wrote a letter raising questions about the leadership. Sources say at least leaders like Mr Joshi and Kalraj Mishra may be too valuable to ignore at a time the Congress has upped the ante in Uttar Pradesh, launching a new Gandhi, Priyanka, in the campaign. The two represent the upper caste voters who are seen to be disenchanted with the BJP and who are being eyed by the Congress.